What is delay skew? Does it matter? Delay skew is a phenomenon that indicates the amount of difference in the arrival times of signals that were transmitted simultaneously. Usually, we would like the signals to arrive at the same time. They often do not, however, and this can lead to synchronization issues, distortion, bit errors, or other negative effects. To understand delay skew, let’s look at an event using category cabling that occurred in the 1990s. When a fire occurred in the plant of a large supplier of plenum rated insulation which was used in cables, the industry put into service cables that had a mix of plenum and nonplenum rated insulation. For example, a cable might be built with two pairs using plenum plastic and two pairs using nonplenum plastic. With all cables, the speed of the signal traveling on the cable, called the nominal velocity of propagation (NVP), varies due to the insulation type and some other less important factors. Most coaxial cables have a NVP of about .80v or 80% of the speed of light in a vacuum. Nonpenum twisted pair is usually rated around 65% of the velocity of light. We say it has an NVP of .65. Plenum rated twisted pair is often closer to .75 or .80 NVP. 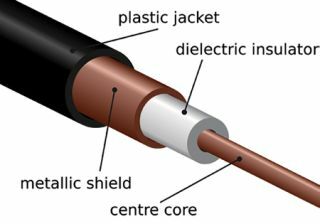 Example cutaway diagram of a coaxial cable. A problem develops when different parts of the cable are sent on different conductors. For example, a digital signal is sent at 1 gigabit per second, a bit is about one foot long on the cable. Let’s say a cable is 100 feet long. A 15% difference in NVP means that bits arriving on one conductor will be fifteen bits ahead of those that arrive on the second cable. In the situation illustrated above in the 1990s, such a difference didn’t matter too much because most twisted pair cables were used for 10 or 100 mbps Ethernet. These forms of Ethernet send the signal in each direction on a single pair. However, later, when the same cables were used in gigabit Ethernet (GigE), a problem developed because GigE used all four pairs simultaneously to deliver the signal. Does delay skew still matter? Yes, it does. Any time-synchronized signals are separated into parts or components and the parts are sent on different pairs, the potential for detrimental effects arises. For example, in the analog video world, component video separates the signal into brightness and two color differences. Each travels on a separated conductor. The greater the length of the cable, the more likelihood there will be that delay skew coming into play. If it becomes a problem, distortion of the video will be the result. Major manufacturers of high quality cabling publish the NVP of their cables. This helps to ensure that consumers are informed on the role delay skew may play in their deployed systems. Phil Hippensteel, PhD, teaches courses on information systems at Penn State Harrisbug. Email your questions to pj15@psu.edu.